Second-View Thrift Store is a hands-on-classroom at Riverview School. 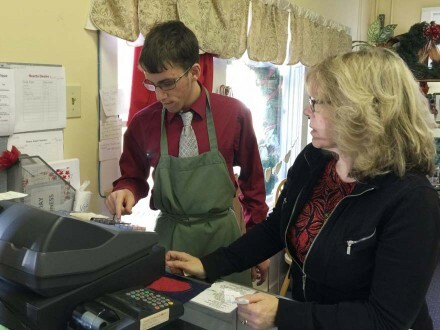 Students working at Second-View gain authentic vocational training in the retail industry. They learn about merchandising clothing and accessories, as well as about providing good customer service to the public. Second-View is located directly behind Café Riverview. Come meet our students who are learning the retail business and find some great bargains and treasures at the same time! All proceeds benefit Riverview School. Riverview’s Second-View Thrift Store featured in Cape Cod Times “Bargains Galore!” story. Second-View Thrift Store is open Monday through Saturday from 9:30 a.m. to 2:30 p.m. The store is one mile west of Riverview School on the right. From Sandwich Center, it is one mile east of Quaker Meeting House Road on the left.